Cut pie crust into 4 quarters. Place one pear half in the center of each pie piece. Roll edges of dough around pear to create a pear-shaped crust, cutting off a small portion the extra thick gathering of dough at the bottom of each pear. 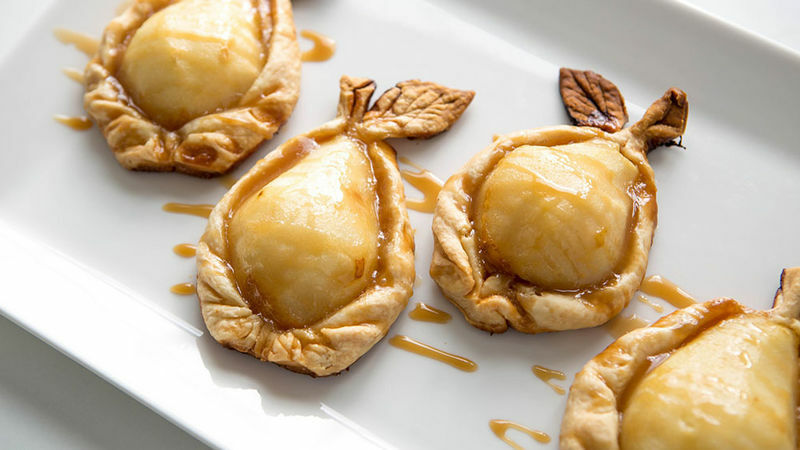 With a sharp knife, cut extra dough into a leaf shape, pressing a dough leaf onto the top “stem” of each pear. Transfer gently to a parchment paper-lined baking sheet. Drizzle with 1 tablespoon of caramel sauce. Bake for 25-35 minutes, or until the dough is golden brown. Drizzle with remaining caramel sauce before serving. Enjoy warm or cold.